China's government now claims that something like 90% of the population are covered by health insurance. It's a statistic that's repeated by people who should know better - including the editor of the Lancet. In reality, the level and breadth of health insurance varies significantly between different provinces. Some have high rates of coverage, some have high rates of investment in their health funds. Some have both, some neither. An interesting analysis in Caixin by Yang Mingyu shows why the patterns of health insurance have emerged. He divides the provinces into four groups, characterised by their health insurance profile. Some he describes as ideal, with high rates of cover (80-90%) and investment (100-1800 yuan per person). These tend to be the affluent eastern coast provinces of Guangdong, Zhejiang, Jiangsu. A second group, typified by Beijing, Shanghai, Tianjin, (and weirdly, Tibet) have high rates of investment in their health insurance systems, but coverage isn't so great - sometimes as low as 60%. 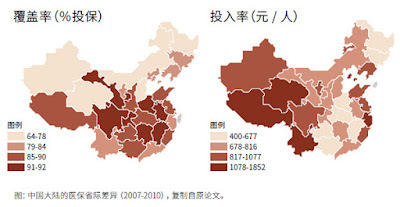 The third kind of insurance pattern is the 'cover' province: Sichuan, Guangxi, Chongqing, which have high rates of insurance cover but only modest investment in them. And finally we have the poor relations - the low cover and low investment provinces such as Heilongjiang, Jilin, Liaoning. Yang Mingyu says the patterns are explained by a combination of economic strength, internal migration and the government's policy to maintain social stability. Investment in healthcare is seen as a major way of preserving social stability. Therefore, the government has invested heavily in health insurance in some of the provinces where there have been large inflows of migrant labour. Conversely, some of the poorer provinces have a left behind population of mostly elderly and children with high healthcare requirements but little capacity to contribute to healthcare costs. The government has promoted wider membership of health funds in these areas to reap premiums needed to support the health infrastructure. However, there have been some 'backward' conservative provinces with few financial resources and also little investment in the health funds. The article concludes by saying that some provinces need to be encouraged to reform their health insurance systems and provide more cover or investment to suit local needs, even if the local circumstances do not favour it.